Do you love Reese’s Peanut Butter Cups? Then I have a recipe for you! You are going to love this Reese’s Peanut Butter Crispy Treats recipe! My oldest son love of all things peanut butter and chocolate led me to create a new after school treat. This was an easy version of Rice Crispy Treats using Reese’s treats, chocolate, peanut butter and some Coca crispy treats. They were very easy to make and after making these, I’m not sure that regular crispy treats will ever taste the same again. Enjoy! What you need to make Reese’s Rise Crispy Treats. Add peanut butter, stirring until combined. Spread into a 9×13 cake pan. Top with cup up Reese’s. 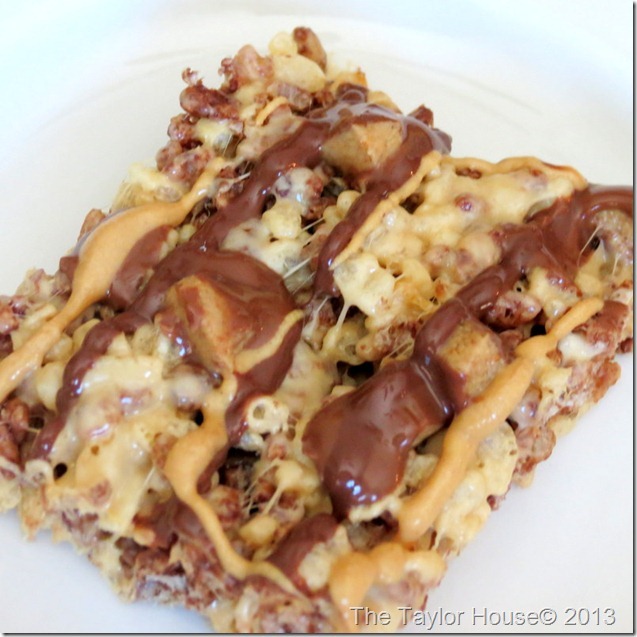 Melt chocolate and peanut butter chips and drizzle on top.